... just completed a 3x flush using it on my '99 at 207k miles. The transmission had been slipping when hot at lower speeds and I had thought "that's it." With little to lose, I did the drain and fills spread out over four thousand miles. Drives much better now. 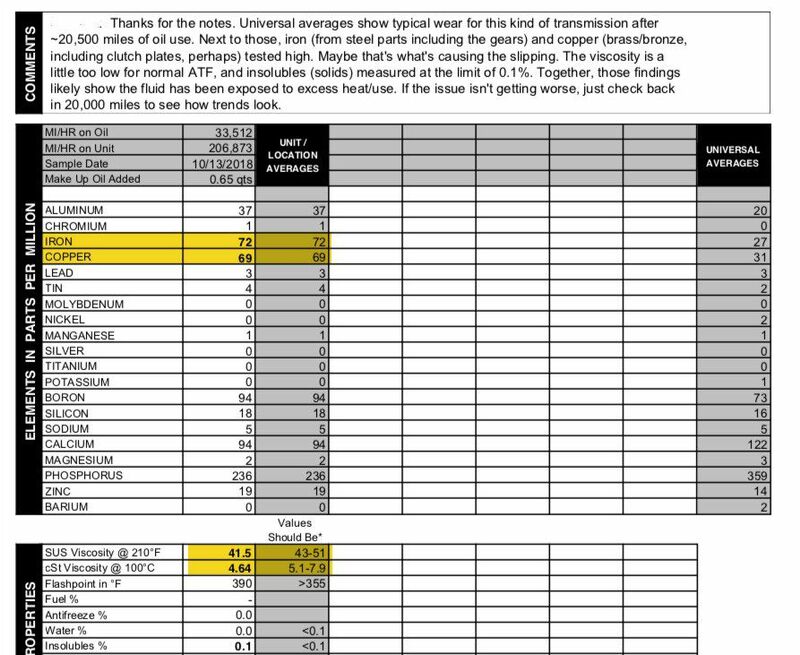 I had last performed the 3x drain-and-fill some 33k miles earlier, so I was surprised that I had an ATF wear issue. See the attached ATF analysis report performed on a sample taken from drain #1. Urban LA commuting crawl is hard on autoboxes. I did notice iron filings on the ATF drain plug magnet, probably the remnants of a disintegrated clutch pack plate. The old ATF was Pennzoil Dexron III Mercon. I decided to switch to the high-mileage Castrol Transmax; we'll see how it works out.